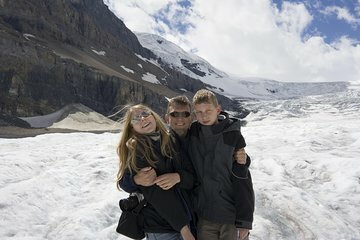 Realice una odisea para los amantes de las actividades al aire libre a lo largo de la famosa Columbia Icefields Parkway de Alberta, para disfrutar de increíbles paisajes y pasear por el glaciar Athabasca durante esta excursión de 5,5 horas desde Jasper. Conduzca por esta increíble carretera, ubicada entre dos parques nacionales increíbles, admirando arroyos alimentados por glaciares, montañas icónicas y la vida silvestre local mientras avanza. Luego haga una parada para dar un paseo a bordo del Ice Explorer todo terreno en la superficie del glaciar Athabasca. Esta excursión a Columbia Icefields también incluye la entrada a la atracción Glacier Skywalk, el almuerzo buffet y el transporte de ida y vuelta desde hoteles seleccionados en Jasper. Pruebe todo lo que las Montañas Rocosas canadienses tienen para ofrecerle mientras viaja a lo largo del majestuoso Icefields Parkway de la provincia, deteniéndose para admirar el increíble paisaje natural, conduzca sobre un glaciar y admire la vida silvestre local. Es una excelente manera de conocer las maravillosas maravillas naturales de esta área. Comience su día con la recogida en hoteles Jasper seleccionados. Verifique con su operador turístico el horario exacto de recolección. Luego continúe en un viaje panorámico en un cómodo autocar, el camino se encuentra entre el majestuoso escenario de Alberta. En el camino, hará una serie de paradas para hacer turismo, incluidas las pintorescas cataratas Athabasca, el Glacier Skywalk y el Columbia Icefield Center. También tendrás tiempo para un sabroso almuerzo buffet caliente. Termine su día con un paseo a bordo del Ice Explorer, que lo llevará a la superficie del majestuoso glaciar Athabasca, admirando la superficie helada salpicada de gruesas manchas de nieve y formaciones de hielo relucientes. Después de su viaje en el Ice Explorer, regresará para conectarse con su viaje de regreso a su hotel en Jasper. Tenga en cuenta que este tour es de temporada y solo se extiende de mayo a octubre. This started out as the best sight seeing tour ever. FIVE Stars! The bus was new and the driver/guide was excellent. We stopped at many beautiful vistas for picture taking. They even provided a souvenir drink mug during a snack and coffee break. Several times we were told we were to have a hot buffet lunch. And, after such a nice roadside snack our expectations were indeed high. But, the lunch was horrible lukewarm and a strange mix - no need to give further description. That was it. The rest of the tour went on to see Banff I think and the remaining tourists that had only signed up for the Columbia Icefield and Glacier Skywalk were sent to wait for an hour to return to pick up points. When they came for us, we were cramped into an employee shuttle van that made economy class air travel look luxurious. Myself, I would have preferred a cold sandwich with a hot cup of coffee for lunch. And, they must have had some mix up sending a van to pick us up. I mean, Really - they can't afford a decent shuttle bus to take us back to our destinations? This is an excellent tour for me and Dad. Pick up bus was exactly on time, wild life sightings were great that day bear, deer, elk, guide/driver Dustin was outstanding excellent speaking voice and presentation pace, very knowledgeable, friendly and helpful, and a very good driver as well, food for lunch was reasonably good, destinations were great Athabasca Falls, Skywalk, and Athabasca Glacier and we were fortunate to have good weather. Tour order was changed to visit the Glacier last after the Skywalk and lunch, and I felt that was a blessing to save the best for last. Very happy and I highly recommend this tour. This trip could have been good had Viator spelled out exactly what this 5.5 hour round trip tour really was. I expected to be dropped back at my hotel appx 5.5 hours later. My group did not get back for 8 hours after being dumped at the lunch spot and told to wait for a shuttle back to Jasper. It ruined our plans for dinner and thus caused our party of 4 a loss. The shuttle back was a filthy mini-van. Read the other 3 star and less reviews and if you plan to do this tour from Jasper back to Jasper, my advice is rent a car and do it yourself. Viator use Brewster who seem to have a lock on this as they also provide the actual Columbia Icefield Tour. Our tour was disorganized and our timings were not good. The driver we had should have told us more about what we were seeing than his personal history, but alas. The lunch at the Icefield was poor - buffet with most dishes almost empty or empty. Items were not replenished quickly and the food was not identified. This food was a waste of money with most items being of a poor quality Chinese food. The two stars are for the sheer beauty of this region. Our day was destroyed because of the laboriosly long day due to Brewster causing us hardship and lost reservations. Even though we couldn't see the iced field because of the weather, the views are amazing and very interesting. This was a wonderful experience although the pictures posted by Viator advertising the tour are somewhat misleading. The ice fields are very crowded and not nearly as pristine as advertised. interesting journey out with a knowledgeable and helpful driver, good organisation at the icefields less pleased with uncomfortable ride back to Jasper in packed mini-coach. Rather crowded at the Glacier/Icefield and delay in return trip due to Brewster 'scheduling' problems, did not help one's positive frame of mind. But the initial Brewster bus driver was excellent and everything was fine until the scheduling problem involving the return of a number of customers to Jasper in a different vehicle somewhat spoilt the day. We were very fortunate to have good weather, great time.